I love hiking. I live in a very beautiful part of our country and I like to get outside to enjoy it as often as possible. Lucky for me the weather has been B-E-A-U-T-I-F-U-L lately. Sometimes it’s my favorite snack bars from KIND. This is not an advertisement or endorsement, I just like them. I like that they’re made out of real food and I like that they taste good. My favorite so far is the Dark Chocolate Cherry Cashew bar because, duh, chocolate. I ate one recently and found myself marveling over the delicious simplicity of fruit and nuts in a perfectly transportable bar when it hit me – I could easily make these myself! With a little help from Jen’s own energy bar recipe on her website Use Real Butter (which you should check out, by the way) and guidance from the KIND ingredients list, I did just that. … drizzling with metled chocolate and BAM. Dark Chocolate Cherry Cashew Bars. If you play your cards right, you won’t even have to turn on your oven. One thing I noted about the KIND Dark Chocolate Cherry Cashew Bars is that they don’t taste specifically cherry-y or cashew-y, and I find my bars turned out the same way. They are flavorful and satisfying though. 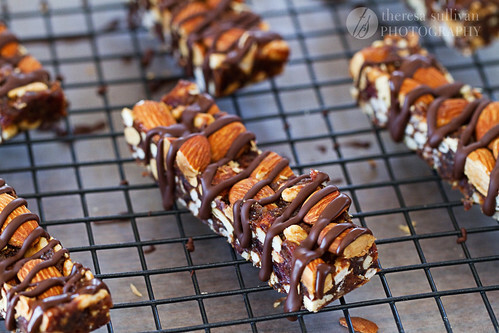 The dried fruit makes the bars just sweet enough and a bit chewy while the nuts give them some good crunch. 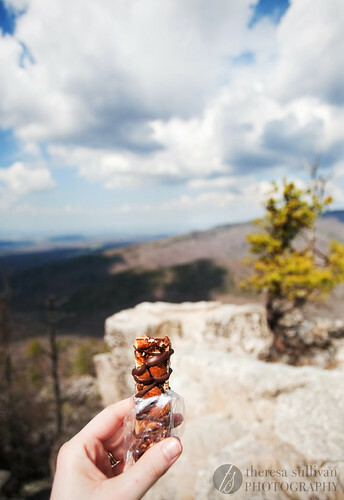 I was a little afraid the chocolate would melt, but during a test hike over the weekend the bars held up just fine in my bag while we hiked through sunshine and enjoyed the nearly 80 degree weather. (80 degrees! In March!) Don’t leave them out in direct sun unless you want a big melty mess on your hands though. 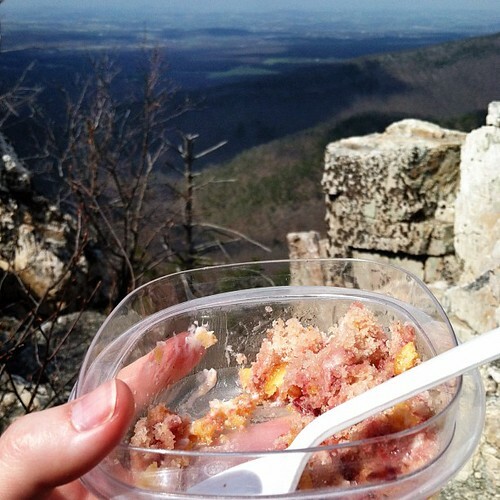 Oh, and I highly recommend eating them with a view. The dried fruit in this recipe is super sticky, which is great for holding the bars together but can be difficult to work with. To make it easier, spray all utensils, bowls and pans liberally with oil. * You can purchase your almonds already roasted if you don’t want to turn your oven on. 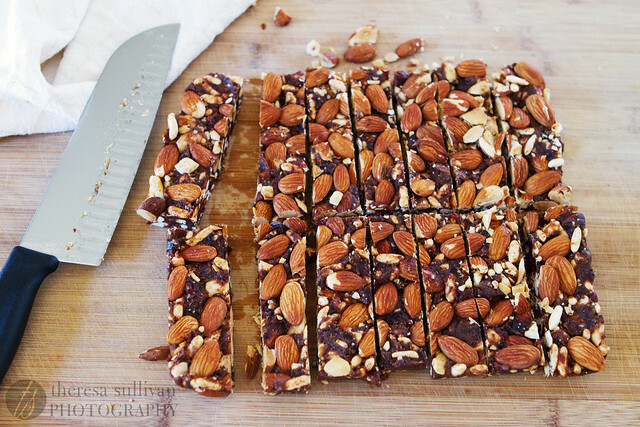 Or, buy raw almonds, spread out evenly on a sheet pan and bake at 350ºF for 10-15 minutes, stirring once. Keep an eye on them so they don’t burn! Line an 8×8 baking pan with two layers of foil, leaving some overhang, and spray with oil. Coat the inside of a large mixing bowl with oil spray. Set aside. In a food processor, pulse cashews until roughly chopped (no smaller than pea-sized pieces). Add to prepared mixing bowl. Spray food processor blade generously with oil. 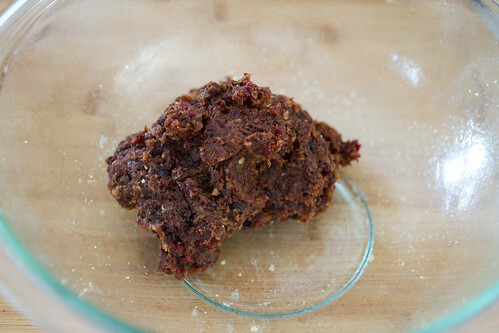 Add all fruits to food processor (dates through cranberries) and pulse until a sticky paste forms, scraping down sides as needed. Add fruit paste to cashew pieces in mixing bowl. Add 1/2 cup almonds and crisp rice. Mix by hand until thoroughly combined. Press mixture firmly into prepared ban. Press remaining 1/2 cup almonds firmly into top. Chill in freezer for about 30 minutes. Spray a sharp knife with oil. Remove bars by foil overhang, place on cutting board and cut into 14 bars. Place chocolate chips in a small, microwave-safe bowl and heat in 30 second intervals until chips start to melt. Continue heating in 15 second intervals, stirring well between each, until melted and smooth. Drizzle over cut bars. Set at room temperature until chocolate is firm, 15-30 minutes. Bars can be individually wrapped and stored at room temperature for a few weeks. If storing longer, place individually wrapped bars in a freezer bag and freeze. Remove from freezer 1 hour before eating. The bars look fantastic! Great views too. Looks like that was a great hike! I love these! Great snack! This is exactly the kind of snack that I miss being able to enjoy. Those pesky nuts and fruit seeds make this is a big no-no for me….but dang it, I can just imagine how good these taste. These make me wish I didn’t dislike nuts so much. I’m ok with eating them on their own, but I can never seem to get past the texture when they’re in a dessert or snack. The rest of the ingredients sound great, though! Do you think it would ruin the base to grind up the cashews in more of a flour rather than pea-sized bits? I might try that and just omit the almonds. I hear you. I have nut issues too – don’t you dare put them in my brownies. It’s taken me years to come around to liking more than just peanuts! :) If you don’t like the big chunks of nuts, you might like Jen’s recipe better: http://userealbutter.com/2012/02/26/homemade-cherry-pie-larabar-recipe/ I’m not sure what would happen if you ground the nuts into a flour… it might make a protein packed fruit bar or it might be gross. LOL Only one way to find out! I suppose you could always just mix up the dried fruit with some oats and more crisp rice instead, if that’s more your speed. Wow, these look just like the real thing! I love KIND bars but I don’t love the price. I’ll have to try making my own. That’s another reason I wanted to make my own bars. Those suckers are expensive! That view looks very familiar, where were you hiking? OHHH! what a great bar….can’t wait to give it a try. We have our own date palms, and the dates are so good. Will have to use different dried fruit….we cant get dried cherries or cranberries very often. I am so happy for this, something to snack on that is actually healthy, and not full of useless calories. THANKS! Just made these- and they turned out amazing! I changed it up based on what I had in my pantry. I used dried cherries, strawberries and cranberries. For the nuts, I used hazelnuts because I had them, and the almonds like the recipe calls for. Huge hit with the husband :) Thanks for an awesome recipe!